Betsy DeVos announcing changes in federal policy on rules for investigating sexual assault reports on college campuses in at the George Mason University Antonin Scalia Law School in Arlington, Virginia Thursday September 7, 2017. DeVos seeks to remove administrative approval for religious schools’ waiver from the 1972 gender parity law. If there weren’t so much else to panic about in the news this week, the recently leaked Title IX draft rules would, I suspect, be getting a touch more attention than Brett Kavanaugh’s 1982 calendar. The New York Times not so long ago wrote up a leaked draft of the Title IX regulations Betsy DeVos’s Education Department intends to submit for a notice-and-comment period. Among other proposals, the draft reveals DeVos’s intention to restore authority to Congress on matters like the meting out of Title IX exemptions to religious colleges. Despite its robust precedent, the religious exemption has met new scrutiny in recent years. Under the law, schools can apply for a waiver from provisions of Title IX that clash with their religious beliefs. Since the 1970s, seminaries and other religious schools have sought to opt out of the gender parity law. More recently, after the previous administration expanded the interpretation of Title IX to include gender identity, increasingly many religious colleges applied for the exemption, foreseeing a new sort of federally-backed culture war. Removing the Department of Education’s approval from the exemption process, as DeVos now intends to do, will make it easier for these colleges to avoid having to comply with Title IX. And they won’t have to explain their reasoning to the Department of Education to do so. “The Department should not impose confusing or burdensome requirements on religious institutions that qualify for the exemption," the leaked draft read. The Trump administration long planned to replace the controversial Obama-era guidelines concerning Title IX that DeVos rescinded around this time last year. And now, as leaked details of the draft have made widely known, the replacement process is well underway: Title IX consultant Brett Sokolow's Association for Title IX Administrators published a version of the draft rules in full on their website. And, as the Times had earlier reported, the draft is dense with much-needed fixes. These new rules will have more authority than the “pen-and-phone” guidelines they’re intended to replace. They’ll include long-awaited adjustments to procedural problems that plagued campuses after 2011’s and 2014’s Dear Colleague Letters required colleges and universities that receive federal funds to investigate and adjudicate sexual misconduct claims on campus. But, unlike some of these corrections to campus sexual assault procedures, the streamlined process for granting religious schools exemption from Title IX is nothing especially new. 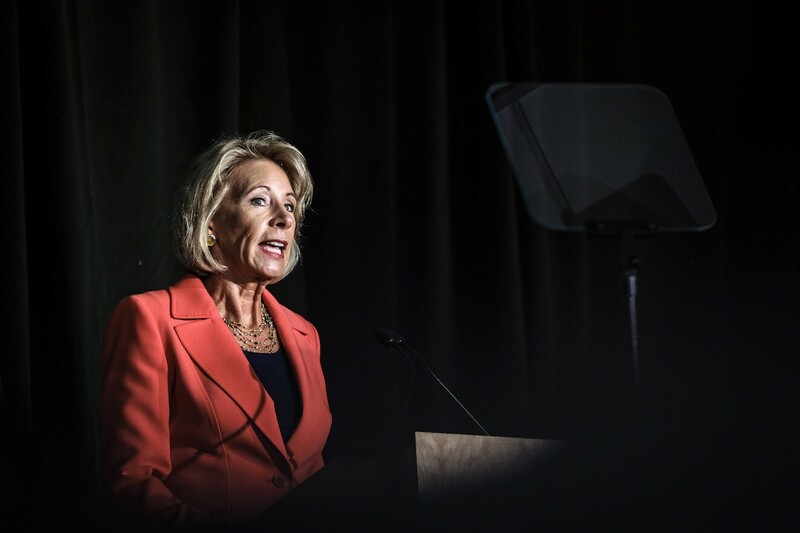 Taking the authority to police gender policy away from the Department of Education and restoring it to Congress—as was the case when Title IX first took effect in 1972—is consistent with what DeVos has said she would do. And, although the leaked document is just a draft, the Education Department’s resolution to cede this power back to Congress seems steadfast. Even though the original 1972 provided for religious exemptions, the department’s Office for Civil Rights (OCR), which oversees Title IX, started reviewing schools’ faith-based objections to the gender parity law in the late 1980s. Since then, they’ve had to submit letter to the feds laying out their objections. Even so, the Department of Education has never denied an exemption request. It wasn’t just conservative Christian schools that won exemptions from Title IX, which the Obama administration interpreted to apply to gender identity. Many Jewish colleges, Mormon schools, a number of HBCUs, and quite a few Catholic seminaries—places where gender discrimination tends not to mean what OCR thinks it means—made the list too. “Many of the exemption confirmation requests in the late 1970s and 1980s were based on schools’ concerns that they would violate Title IX by reserving certain job positions to men,” a particular risk for denominational colleges with male chaplains, per Greg Baylor, director of the Alliance Defending Freedom’s Center for Religious Schools. OCR’s approval never amounted to much under the law, according to Mat Staver of the Liberty Counsel—who said the drafted rule holds Title IX to its original meaning. By 2016 this system of intermediary exemption approval, which had begun in the late 1980s, was less for bureaucratic record-keeping than it was a tool for the politically-motivated manipulation of schools that had traditionally put faith before gender politics. The 2016 list was published at the urging of the Human Rights Campaign and a clatch of Democratic senators. Even critics of the religious exemption point out that the social changes t hey most want to see on conservative Christian campuses will have to come on these communities’ own terms, if ever. Whether or not they realize the feds’ forcing their hand won’t help, it’s soon to be a thing of the past: These draft rules, with the religious exemption sans-departmental-approval baked in, will have the force of law once they pass notice-and-comment. So, unlike the guidance documents DeVos rescinded last year, they’re not going to fall quite so easily to next administration’s whim.